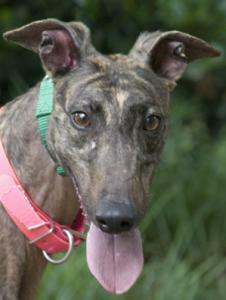 Kat is a tiny, 56lb, brindle female. Her sire is the famous Lonesome Cry and her dam is CTW Fanny Flash. She raced 9 races in Birmingham but didn't win any of them so was retired. She turned 2 on December 22nd. She is very friendly and sweet. Kat has a very light hair coat even for a greyhound. If you want a greyhound that won't shed much this is your girl! Kat has been in an adoptive home since June, but is being returned because her owner does not have a fenced yard and has to leash walk her. Kat is great on leash except when she sees the rabbits in the neighborhood on walks. She pulled her elderly owner down a couple of times trying to go after a rabbit. Kat does potty nicely on leash and is great on leash most of the time. Since she is a tiny female she just needs an owner that is a little stronger and maybe fewer rabbits in the yard. Kat is pretty confident and curious about new things and loves everyone she meets. She is a great girl, but like a typical greyhound,Â does get a little excited when she sees a rabbit. Kit Kat likes kids and has been around them in her former home.